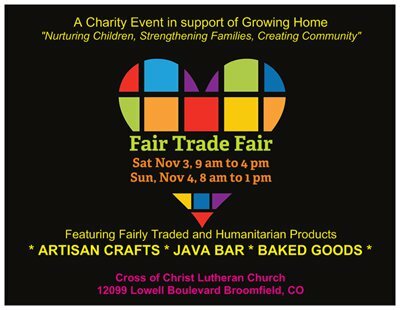 The annual Fair Trade Fair at Cross of Christ is held, this year, on November 3rd from 9:00 a.m. to 4:00pm and November 4th, 2018 from 8:00 am to 1:00pm. Each year we have numerous handmade items from countries around the world through Dream Stream, Cards for Caring, Circle of Hands Uganda, and many other participants, with the proceeds going 100% back to the charitable organization and artisans. In addition, craft items made by members of the church plus baked good and a java bar are available. All of the proceeds from the local crafts, baked goods, and java bar are donated to Growing Home.